In simple terms, a 'Pergola' is a series of cross-beams placed over columns. It is an aesthetic feature, as well as provides a certain amount of shade below it. 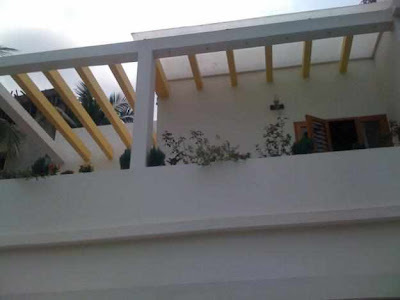 In Modern Kerala House Design, we see many balconies and porches covered with a pergola over it as an interesting elevational feature. 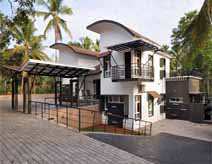 Kerala homes use Pergolas mainly in the balconies and also over internal courtyards. 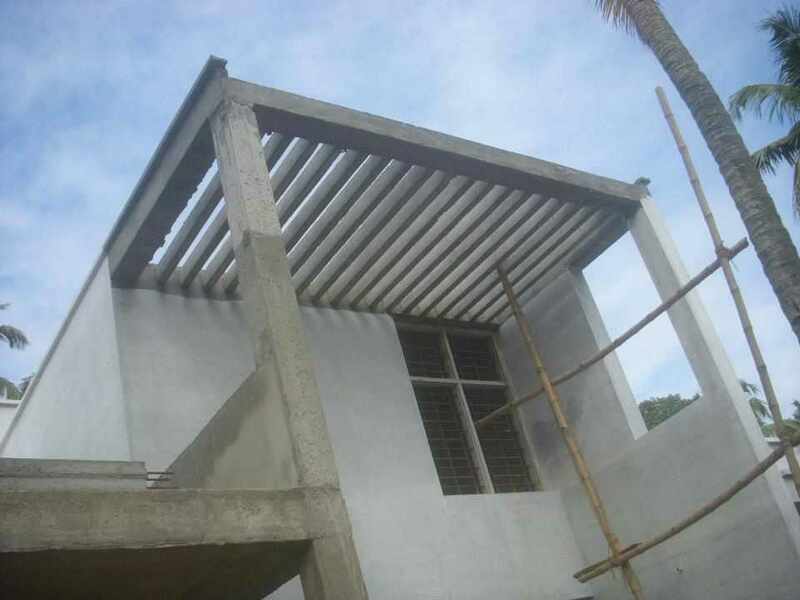 Unlike roofs, Pergolas do not offer protection from rain. Hence, when they are used above interiors, a tempered glass or polycarbonate sheet is provided over it to prevent water from entering inside. 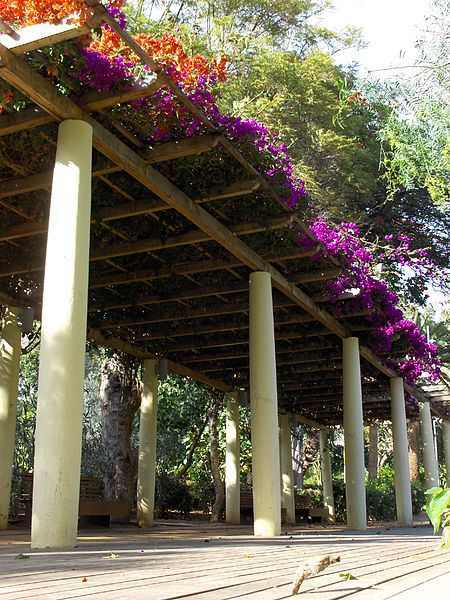 Although they do not offer rain-protection, Pergolas can be used to provide varying degrees of shade below it. 90% of the sun's rays pass through at noon-time, but when the sun is at an angle, the series of beams create shade patterns that block the sun. Pergolas are an excellent feature for roof gardens. Potted plants and lamps can be hooked over it; and garden vines can be grown over it. 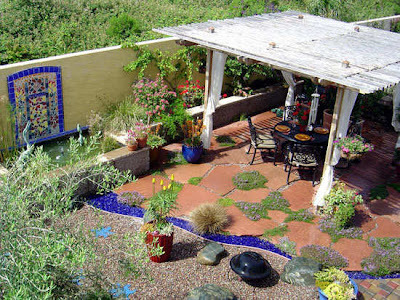 It offers the much needed sunlight for the garden. In Nadumuttoms, the Pergolas provided above the courtyard create dramatic shade patterns. Free-standing pergolas can also be provided in the frontyard as a garden feature or a gazebo. It can also be used above Padippura gateways. 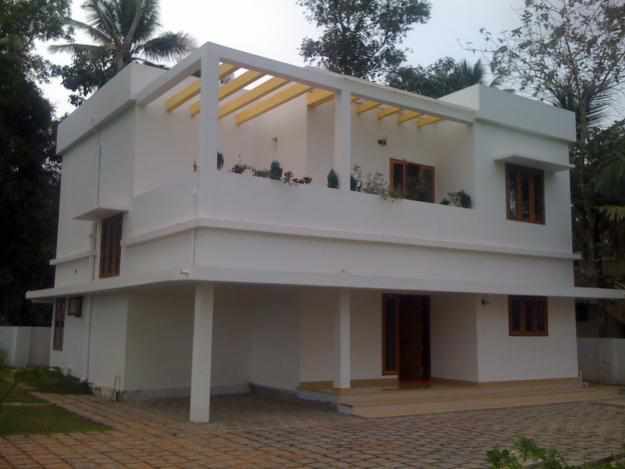 This is a common design issue in Kerala Homes; especially where space is limited. 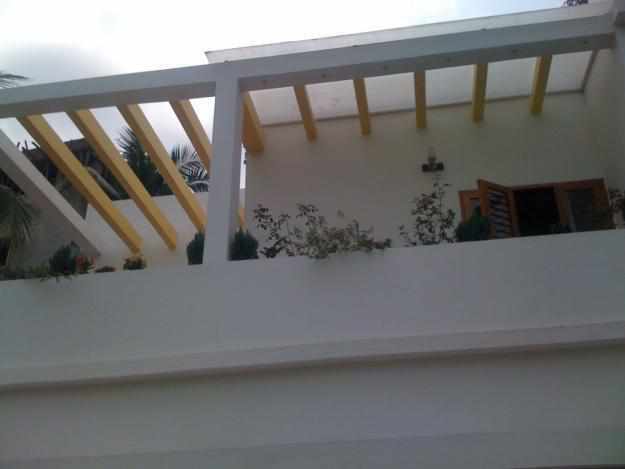 From the veranda, you enter into a Common Hall that is divided into the Living and Dining Areas. The usual approach has been to provide a shelf that partitions the hall. This could act as a bookshelf on the living room side; or a crockery shelf on the dining room side. 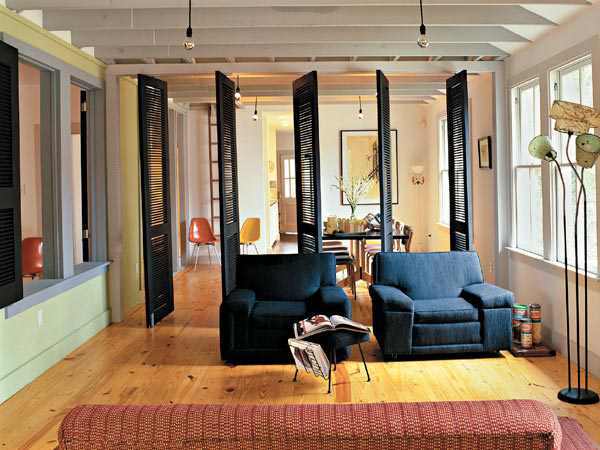 Here are some stylish ways to divide the hall into living and dining areas. 1. The open shelf- It does not completely obstruct the view to the dining area from the living room, but still provides adequate demarcation of the space. 2. The screen- A decorative fixed screen with a perforated design that matches the design scheme of the interiors. 3. 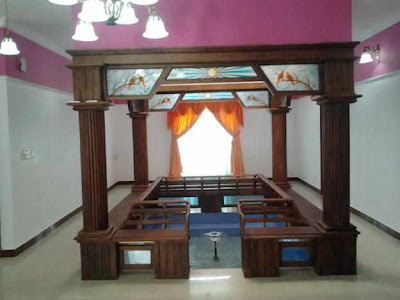 Open shelf with Jalis sofa- The sofa and cushions along with the open shelf adjacent to it creates a separate living space within the common hall. 4. Post and Lintel- This is a very commonly used design solution in Kerala homes, to separate the Living Room from the Dining Area. It consists of a lintel supported by columns; as an interior design feature. 5. 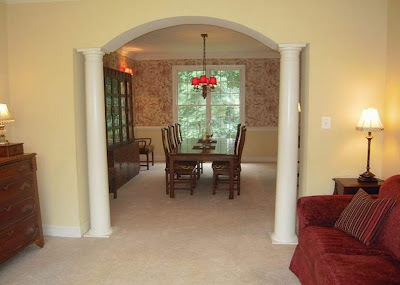 Arch and Column- Another commonly seen design solution that separates the Living Room and the Dining Area- with an entrance arch supported by round columns. 6. Pivoted screens- This is a dynamic solution to a Hall separator. The screens are pivoted at the top and bottom which lets you control the privacy required between the living and dining areas. They can be left open or completely shut, as desired. 7. 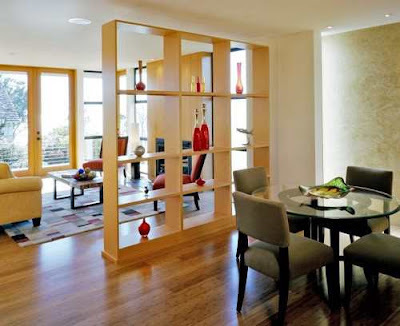 Bookshelf wall with door shutters- If the Hall is large enough, a large partition walled bookshelf can be provided with a shuttered door; that can create two separate living and dining spaces. 8. Ceiling-hung curtain- Sometimes a simple ceiling-hung curtain will do the trick as can be seen from the image below. 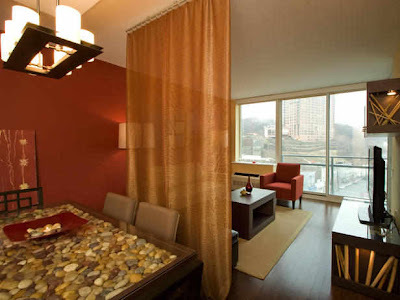 The key is to match the curtain design with the ambiance of the interiors. 1. First, do some space planning. 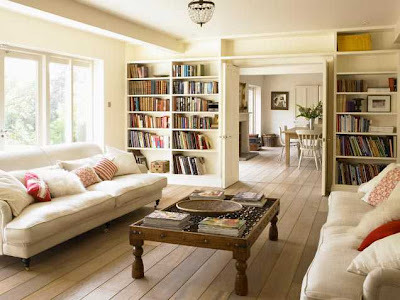 Measure the room and decide how large each section will be, considering any relevant factors. A big family will need a larger dining space than a small family. Next, decide what furniture pieces are necessary. 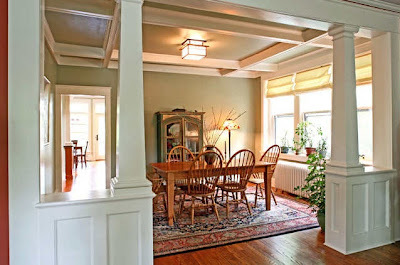 A dining room will need a table and chairs, A living room might need a sofa and TV. 2. Separate the living space from the dining area. You can divide the space physically by using an actual space separator such as a folding screen, bookshelf, or other such room divider. 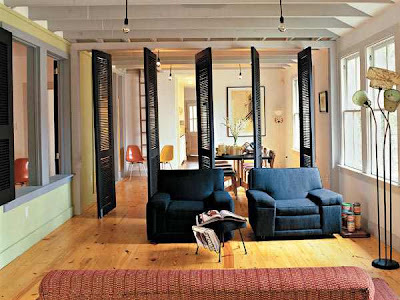 If room dividers are too obstructive for your tastes, or if you feel the room is too small for them, try a less defined option, such as a row of potted plants or a hanging curtain of sheer fabric or beads to let light through. Or, you can divide the space visually instead of physically. Paint the walls in each area a different color, then use furniture placement and area rugs to define each space. 3. Bring in the furniture. But first, carefully consider what size furniture you will need; nothing cramps a room like furniture that is too big for it. Round dining tables take up less space than rectangular ones. In very small dining rooms, consider folding chairs that can be easily stored away or leaned against the wall when not in use. 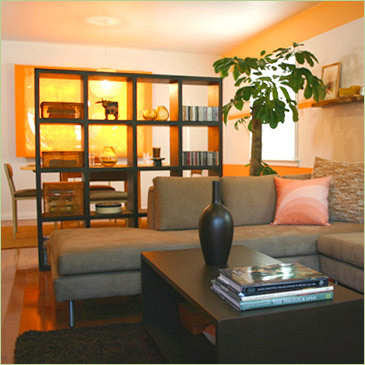 In very small living rooms, skip the coffee table and use only end tables. A flat-screen mounted on the wall is much less obtrusive than a traditional television, which would also require a space-hogging entertainment center or TV stand. With over 300 clear sunny days available annually in Kerala, there is a huge potential to tap, store and retrieve solar power, much more than the current power requirements. However, the actual exploitation of solar power to meet the energy requirements of the country is insignificant when compared to other energy resources. 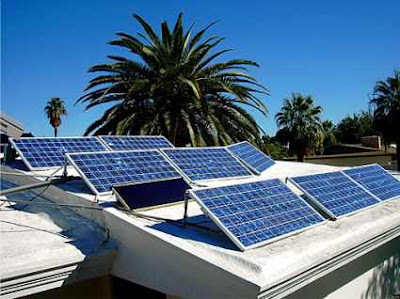 Also, the use of solar-powered systems and devises have remained under-utilised mainly due to high unit costs. The government is, therefore, taking several initiatives to address this challenge, and provide a framework for expanding solar energy markets by bringing down the costs. 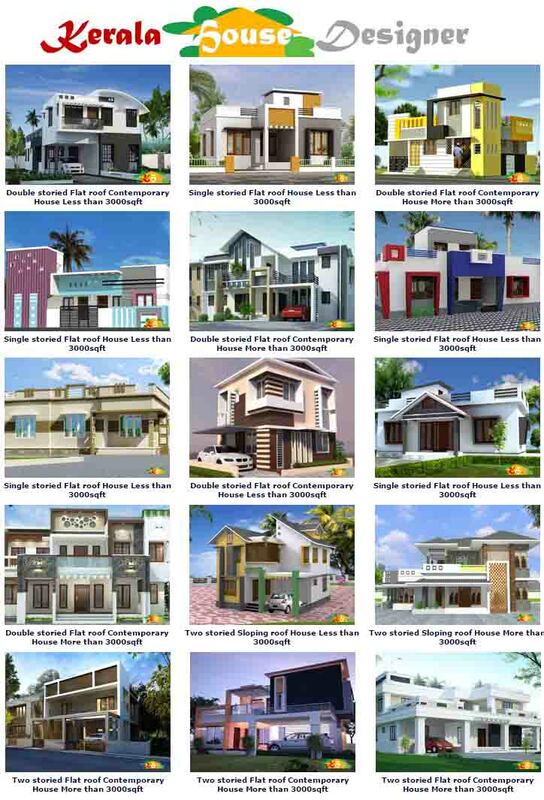 Solar PV power packs – 30% capital subsidy and loan @5% on 50% of capital cost. o PV crystalline silicon solar cells shall be used. Solar Thermal (Solar water heaters) – Rs.3,000/- per sq.meter for ETC collectors and Rs.3,300/- per sq.meter for flat plate collectors. In respect of home lighting systems, up to 200 Watt lighting system with 2X100AH battery set at an estimated cost of Rs.60,000/- was prescribed by MNRE. The subsidy amount is Rs.18,000/- and loan amount is Rs. 30,000/-. 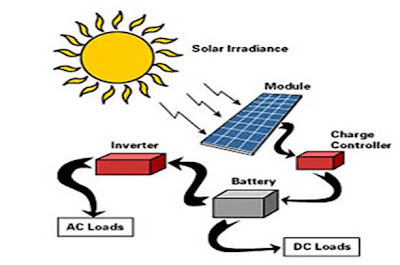 Inverter based systems are also eligible for financing scheme. Individuals are eligible up to 1KW (5KW for water pumping scheme) and commercial/non- commercial entities are eligible up to 100 KWp. Micro-grids can be up to 250kW. Capital subsidy would be released to the banks upfront, on receipt of sanction of loan by the bank to the borrower. The loan amount is repayable in monthly installments within 5 years. The banks will get refinancing of loan amount from NABARD(through IREDA) at 2%. 2013) of the Jawaharlal Nehru National Solar Mission, and will cover projects specifically approved by the project approval committee (PAC) of MNRE. MNRE, in consultations with IREDA and NABARD, has finalised 11 model projects eligible for financing by the banks. The quantum of capital subsidy and refinance would be made available as per the specifications of MNRE/ IREDA from time to time. Currently, the capital subsidy would be to the extent of 30 per cent of the benchmark cost. For 2010-11, the benchmark price for PV with battery backup is considered as 300 per watt peak (Wp). For systems which do not use storage battery such as water pumping systems, the installed PV system cost would be considered subject to a cap of 210 per Wp. Borrowers are required to bring in 20 per cent of the cost of the project as the margin money for accessing credit facilities from banks to acquire the assets. Loans would cover the balance after reducing the eligible capital subsidy, and would be extended with a repayment period not exceeding five years. It would carry an interest rate of 5 per cent per annum. No interest will, however, be charged by the financing banks on the capital subsidy component. 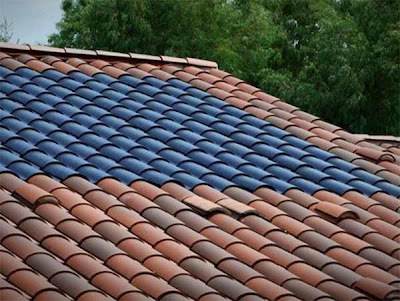 Named ‘Amrita Smart,’ the integrated solar tile can both harvest and store power on sunny days. The power can be used to recharge laptops, cell phones or to light up the house during nighttime. The product weighs in at 200 grams and it will be made available on the market in two years, says Vinod Gopal of Amrita Center for Nanosciences, Kochi. We have seen a variety of solar products that can only harvest power from sun. But, most often, for storing the power, extra battery will be required. It is here the Amrita Smart becomes unique. The invention is certainly noteworthy, because it will be inexpensive and efficient as well. In addition, it will be easy to set up given the fact that it is an integrated product. The Amrita researchers showcased their invention at the International Conference, NANOSOLAR 2012. The solar conference was conduced by the Amrita Center for Nanosciences at the Amrita Institute of Medical Sciences in Erankulam, the industrial city of Kerala. The integrated solar power tile is a notable invention. 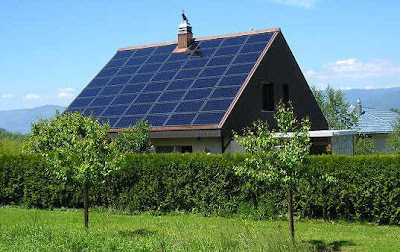 It can be used for home-based production of sustainable power. 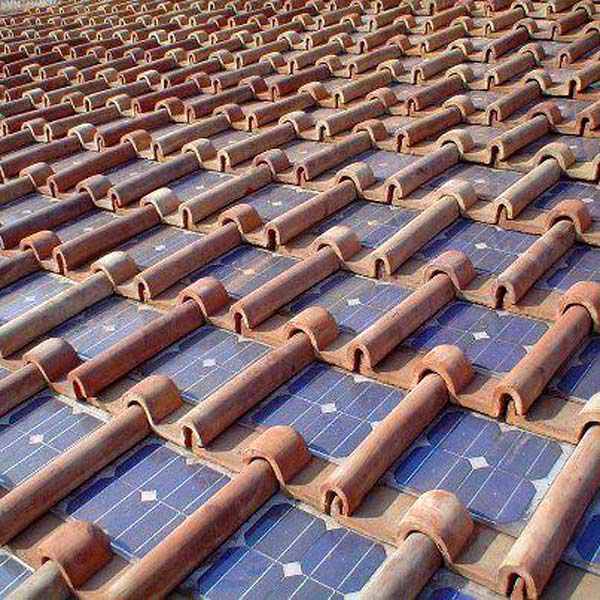 People can now embellish their rooftops with solar power generating-and-storing tiles. To an extent, it will bring the electricity bills down as well contribute much into the reduction of carbon footprint.